I always forget how hilly this part of Suffolk is, where the last gasp of the Chilterns lifts its head between the Stour Valley and Newmarket Heath. I was also close to the Cambridgeshire border, which winds in a most curious way around the town of Newmarket, so that you find Cambridgeshire villages to the east of Suffolk ones, and so on. It can be a little confusing if you aren't an East Anglian, I expect. And the villages around here are very pleasant; Wickhambrook is to the south, lovely Lidgate just off to the west, and the rich, horsey Cambridge commuter belt of Gazeley, Moulton and Dalham to the north. I was surprised just how big Ousden was as I followed the road that my map said led to the church. At first, I thought I had found it, but it turned out to be a modern cemetery with a lychgate. The road descended steadily, and I was wary of shooting straight past, and then having to cycle back up the hill again. The slope went on and on, and after about a mile, and just when I though that I must have missed it, and would fall off the edge into Cambridgeshire, there it was, St Peter, in a beautiful setting in the grounds of the Hall. A track leads up to the church past a large dovecote in a field to the east. I pushed my bike through the churchyard gate. To the right of the entrance was a little fenced off area, against the Hall hedge. The 19th century graves it contained must be for members of the former family there. 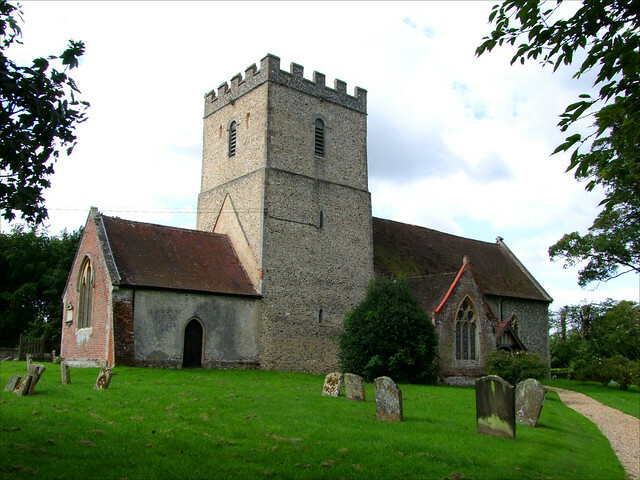 St Peter is that rare beast in Suffolk, a cruciform church. The Norman tower is also unusual, because it seems to have been very little altered over the centuries, common enough in other counties, but rare in Suffolk. As ancient as the chancel is, there must have been an earlier one, for the former roofline shows on the east face of the tower, at the same height as the nave. Beyond the church, the graveyard is fenced off for sheep to graze, but you can climb over and take a look at the south side which is equally interesting and lovely, with a rather extraordinary north doorway, and a memorial to Peragrine Clackett. Mortlock thought that the Victorians had extended the nave, but it is all done very well indeed. A pretty little 18th century chapel, which Mortlock tells us was the family pew for the Hall, is the finishing touch. The Norman tower and chancel arches are solid affairs, quite different to the fey Decorated and Perpendicular architecture found in most of the county. It is worth taking a close look, since there are a number of unusual carvings on them. Ousden is most famous for its memorial to Laeititia Moseley, which features Suffolk's finest and scariest skeleton. She wears her shroud and grins wildly. Quite what generations of Ousden children have made of her I couldn't say, but I bet she has been the catalyst for more than a few bad dreams. three tymes ten yeares a wyfe & then she dyed. Sad to recount her losse, glad for her glorye. I love stepping into churches like this - they are so out of the ordinary. I always think it must be very curious to worship in one, since there is a sense in which the church is actually three separate buildings that just happen to be joined together. Sometimes, this feeling is alleviated by enlarged archways, as at Pakenham, but here, the low Norman arches survive into the area beneath the tower, making the vistas very tight and narrow. It is a salutary reminder that the nave and chancel were built for different purposes, and not for congregational Anglican worship at all. This is a lovely church, full of interest. It was well worth the long climb back into the village afterwards.